Arsenal Pulp Press, 9781551526331, 256pp. This unsettling novel is set thirty years in the future, in the wake of a third world war. Runaway effects of climate change have triggered the collapse of nation/states and wiped out over a third of the global population. One of the survivors, a former soldier nicknamed Mercy, suffers from PTSD and is haunted by guilt and lingering memories of his family. His pain is eased when he meets a dancer named Ruby, a performer who breathes new life into his carefully constructed existence. But when his long-lost brother Leo arrives with news that Mercy's children have been spotted, the two brothers travel into the wilderness to look for them, only to find that the line between truth and lies is trespassed, challenging Mercy's own moral code about the things that matter amid the wreckage of war and tragedy. Set against a sparse yet fantastical landscape, The Mercy Journals explores the parameters of personal morality and forgiveness at this watershed moment in humanity's history and evolution. Claudia Casper's previous novels include The Reconstruction (St. Martin's Press). 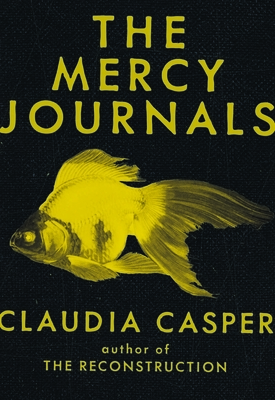 Claudia Casper: Claudia Casper is the author of two previous novels, The Reconstruction (St. Martin's) and The Continuation of Love By Other Means (Penguin). She is writing a screenplay adaptation of The Reconstruction for a 3D feature film co-production. She teaches writing at Kwantlen Polytechnic University.